Our program is dedicated to Paul Price Sr, who had the fortitude and desire to encourage the borough of Audubon to create both an Amateur Radio Club and Community Emergency Response Team under the auspices of the Office of Emergency Management. The Borough of Audubon Mayor John Ward was fully supportive of the idea and when asked if the soon to be organizations could utilize the old Audubon Heavy Rescue building on Oak which was not in any official use at the time. Once approved, OEM quickly appointed a CERT Coordinator Stephanie Shirk and a Municipal Radio Officer Jim Tieman WA2WUN. From there an alliance was created between the Audubon OEM and Barrington OEM under Director Mike DiPierri. Once finalized, Paul wanted to start a radio club, in honor of his father and brother who were both amateur radio operators. So with that in mind, the idea of the club was founded in April 2015 with the club having its first meeting in September of 2015. The club was recognized by the American Radio Relay League (ARRL) as an affiliated club in November of 2016. The club officers were nominated and elected in January of 2016, As of 2018 the Officers are: President Rick Tighe N2PHI, Vice President Bill Bacon KE2XC, Secretary Rebecca Martel KD2ORS, Treasurer .Debra Licorish W2DAL. The Audubon Amateur Radio Club adopted its constitution and bylaws, and was officially recognized by the Internal Revenue Service as a 501c3 organization. Encourage the advancement of the art and science of radio. Promote the development of an emergency communication capability to assist communities when needed. Develop a pool of trained radio operators. Promote international good will by connecting private citizens in countries around the globe. Through ham radio, you will become an ambassador for your community and your country. Amateur (or ham) Radio is a personal radio service authorized by the Federal Communications Commission (FCC). It is a non-commercial voluntary radio service. Amateur Radio Operators as well as supporting Amateur Radio Emergency Communications Services when called upon. We will support the American Radio Relay League (ARRL), Amateur Radio Emergency Services (ARES) and the Radio Amateur Civil Emergency Services (RACES). Dedicate support to an individuals advancement by encouraging, training and testing to obtain both entry level and higher class Amateur Radio Licenses through the Volunteer Examiner Program. 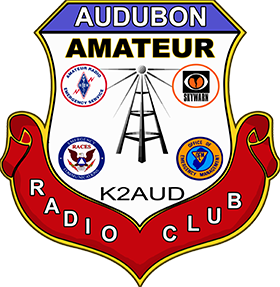 Audubon Amateur Radio Club is dedicated to community service and increasing the awareness of Amateur Radio among the general public by providing education about the history, operation, functions and benefits of the Amateur Radio Service. Audubon Amateur Radio Club will help support the Tri-State Maritime Safety Association Maritime Incident Response Team for all activations and activities.